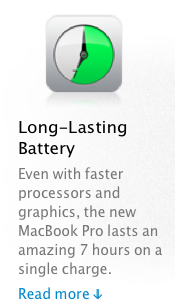 Apple falsely advertising battery life on laptops? Apple advertises "up to 7 hours battery life" for wireless web browsing on its MacBook Pro line of computers even though nobody can get 7 hours of battery life. There is a rather lengthy discussion going on in Apple's Support Forums because 7 hours is not realistic with the latest version of OS X Lion. Users who previously ran Snow Leopard were able to get over 7 hours of battery life in some cases, but since the release of Lion battery time has tanked. I am averaging about 4 hours of battery life with only a browser running, and screen brightness at 50%. I purchased a new MacBook Pro 15 and a MacBook Air 13 about 5 weeks ago. Both machines could not get anywhere near 7 hours of battery life with their stock configurations. Apple has failed to acknowledge the issue publicly and has basically left users like me in the dust. What can we do? Nothing. There are hundreds of thousands of views of this discussion in Apple's Forums and we still have no answer or acknowledgement of the problem by Apple.